That's neat! I liked the Champs sets back in the day. Also, that mini one touch is actually really cool. I need to get one of those, ha. 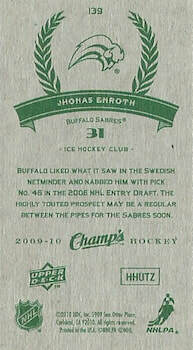 Yeah, some of those Champs parallels were really hard to find. In a way I feel lucky Hjalmarsson's rookie year wasn't a year later, because the parallels in 2009-10 were a pain to find. 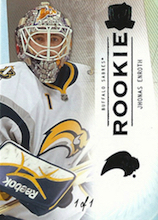 The rookie Parkhurst Backs were 1:1,500 packs or something like that. And I can't see your pictures, but your pickups sound amazing! Congrats! 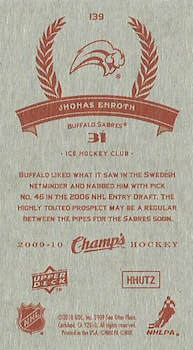 And crease collector arent you sabresman31? 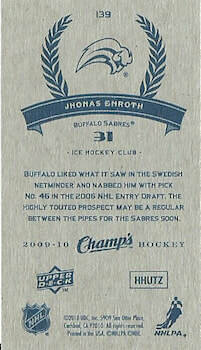 Nope, Sabresman31 is another big Enroth collector. His name is Kyle. And for your images I would suggest signing up for Flickr or something to upload/post your images. 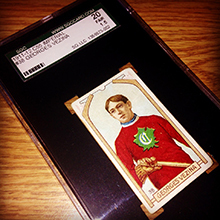 A lot of collectors use that image platform.